City College Mending Fences with Neighbors? <b>TURN IT DOWN:</b> Dan Iacofano funnels heat generated by Mesa residents upset by noisy City College students. Daniel Iacofano doesn’t pretend to be Moses, and there’s little risk he’ll be parting the Red Sea anytime soon. 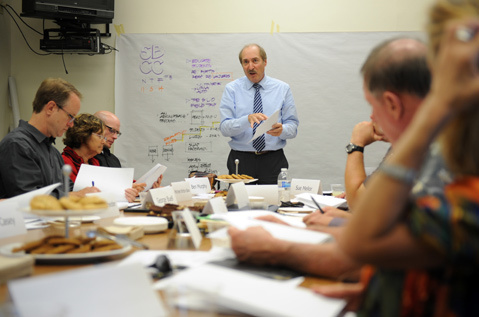 But the professional facilitator ​— ​capable of holding up to eight magic markers in one hand at the same time ​— ​may be making real progress toward soothing the bad blood between Santa Barbara City College and its neighbors. Iacofano was hired by City College to lead five intensely focused meetings with residents ​— ​angry about rude, noisy, and occasionally violent students ​— ​college administrators, and a bevy of high-ranking city officials. Based on the third encounter last Wednesday, Iacofano and the Neighborhood Task Force appear on the verge of achieving actual results, at least where noise complaints are concerned. Cal Poly officials entered into a memorandum of understanding with city police to run what’s known as SNAP (Student Neighborhood Assistance Program) to address noise complaints against exuberant, unruly students. The police hire and train a cadre of student enforcement officers empowered to patrol neighborhoods outside the campus and issue warning citations for noise violations. If the first visit doesn’t achieve the desired results, a sworn officer is dispatched for round two. The first ticket costs $350; the second is $700. During certain times ​— ​like Halloween and the first week of school ​— ​the fines are doubled. The names of offending parties are sent to Cal Poly’s Dean of Students for follow-up action. In addition, the San Luis Obispo noise ordinance is far less cumbersome and subjective to enforce than Santa Barbara’s. There, any noise emanating 50 feet beyond the property line before 10 p.m. is a violation. After 10 p.m., the limit is the property line. It’s that simple. Offended neighbors need not sign a complaint, either, eliminating the fear of potential retaliation. Last, in San Luis Obispo, noise violations are not deemed criminal violations, meaning they’re treated as infractions rather than misdemeanors. Because Santa Barbara’s ordinance is criminal in nature, alleged violators are entitled to a jury trial. And because of that, Santa Barbara police contend, they experience difficulty persuading the District Attorney’s Office to file charges. Writing all the major points down in a tutti-frutti-colored splash of meticulous calligraphy was the facilitator, Iacofano. When the conversation got off point, he reined it in, seeking to tease solutions out of conflict. Whether he got there remains too soon to say. Many of the broader issues creating tension between City College and the surrounding community ​— ​traffic, parking, and housing ​— ​exceed the scope of the Task Force. To the extent students ​— ​or their all-too-absent landlords ​— ​can be encouraged to modify their behavior, the Task Force might find points of consensus. City College officials initiated the Task Force after Beebe Longstreet, a longtime member of the city’s Parks & Recreation Commission and lower Westside resident, took her complaints to a recent Board of Trustees meeting. She got results. Two boardmembers, Marianne Kugler and former Santa Barbara mayor Marty Blum, are regulars at the Task Force meetings, as is City College Dean of Student Development Ben Partee. Likewise, City Hall dispatched not just Mayor Helene Schneider but also acting City Administrator Paul Casey. As to the broader issues of shared concern, Schneider stated she intends to host a joint meeting between the City Council and the Board of Trustees. It might not be the first ever, said former mayor Blum, but it would be the first that wasn’t strictly a ceremonial dog-and-pony show. The next Task Force meeting is scheduled for November 20.